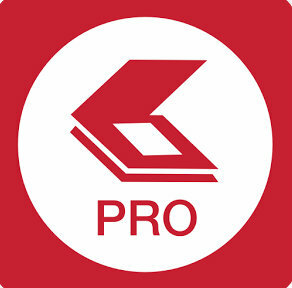 ABBYY FineScanner Pro – is the first scanner App in the world for scanning books and docs with your iPhone and iPad, using the latest breakthrough online BookScan technology. It’s a top mobile scanner for iPhone or iPad from world-leading OCR software company ABBYY. FineScanner Pro turns your iOS device into a smart and powerful all-purpose mobile scanner to quickly capture and scan your docs and books, it can create electronic copies in PDF and JPG, and allow you to apply online OCR to recognize texts from scans for further editing and docs sharing. Also, Check – Top Paid Game BADLAND Free Download And Install On Your iPhone No Jailbreak No PC. ABBYY FineScanner Pro Ranked #1 Business application in 98 countries and Winner of SUPERSTAR Award in the ‘Document Capture’ category in the Mobile Star Awards. FineScanner from ABBYY is a great app, which has value beyond its business credentials and becomes the top-selling app. It is a useful mobile device tool for keeping track of and backing up important and not so important Docs and information. Also, Check – Automatic Call Recorder Pro App Free Download For iPhone No Jailbreak No PC. With this tool, you can use your iPhone/iPad with FineScanner to scan paper documents, books, agreements, receipts, magazine articles, notes, recipes, pictures, charts, tables, slides, whiteboards or even billboards on the street and get perfect digital scanned copies. its best for individuals, business, government or school use. One can use it anytime, anywhere. PDF & JPG – User can scan any printed or hand-written text and save scans to JPEG images or even into cross-platform PDF documents. BookScan TECH – you can enable the Book mode on your device camera and take snapshots of facing book pages. BookScan will split the opposing pages into two separate images and makes correct any distortions and lighting defects. It will then unbend any curved lines of pages as if you pressed the book against the glass of a conventional scanner. 3D TOUCH & SPOTLIGHT – Device version iOS 9 or higher, with iPhone 7 Plus, iPhone 7, iPhone 6s Plus, iPhone 6s, access or find documents by pressing the app icon on your iOS device a little bit harder. Spotlight Search allows you to find any scanned docs from iPhone home screen. PASSWORD ON PDF – you can add a password for the image-only PDF files while exporting and sending via email. MULTIPAGE DOCS – you can create, edit, and enhance separate images or large multi-page documents without any additional selection on the viewfinder (up to 100 pages per document). AUTO-CAPTURE AND FILTERS – It has excellent visual quality with auto-capture of page boundaries and advanced image filters feature, which processes scans in color, greyscale or black-and-white versions of docs. BEST-SHOT PHOTO MODE – you can select Best-shot button on viewfinder and FineScanner will automatically choose and processes the best of three images captured by you. BUILT-IN FILE STORAGE – you have got built-in file storage for save scans inside the app with tags and search capabilities. SHARE & EXPORT – it allows you to send results by e-mail, save in cloud storages – iCloud Drive, Dropbox, Google Drive, Yandex.Disk, Evernote and more, transfer docs to your Mac or PC using iTunes sharing. AirPrint – It can print out scans directly from your iPhone or iPad. ABBYY Finescanner Pro For iOS 10/11 Download And Install, Follow Some Simple Steps Given Bellow. For Download, you have to Click on Button Given Below “Finescanner Pro Download”. Once the app will get installed you can open Finescanner Pro. Then again a tutuapp prompted will appear need to Tap Install. The tutuapp installer will be installed and then you can open Finescanner Pro app and enjoy. Do you like Finescanner Pro? Please leave a review. Thanks a lot for visit us on iosbuckets. If you have any queries you can comment on comment box our team will reply you as soon as possible.